I remember wham I first heard of Oingo Boingo, following their debut 10″ for I.R.S. Records in 1980. I was listening to WPRK-FM around that time and had discovered that college radio had moved on with the times. Listening to WPRK-FM three years earlier revealed a playlist of ELP deep cuts! Obviously, things had changed over time! The cuts I’d heard from the 10″ EP were jerky-jerky, horn driven quirk rock with a heavy New Wave patina. The band had a feel somewhere between DEVO and Frank Zappa. I was aware of their origins as an alternate theater group, The Mystic Knights Of The Oingo Boingo. I admired them, but never took the bait until years later. Actually, I’d bought a copy of Danny Elfman’s “So-Lo” album on LP when it came out. Technically, that was the first Oingo Boingo recording in the Record Cell, since it was in all but name the fourth Oingo Boingo album, but that went out in the Great Vinyl Purge and has not been replaced on CD, in spite of the best intentions. I guess the idea there was “Oingo Boingo is such a weird name, let’s try Danny’s instead and see if anything happens.” Well, “Dead Man’s Party” in 1985 was another Oingo Boingo album, so we can see how that went over. When A+M released the first batch of Oingo Boingo re-releases on the spinning, silver discs, I immediately bought their second album, “Nothing To Fear” since I had great memories of seeing the band on MV3 lip synching the deep cuts “Nothing To Fear” and “Insects” to a studio audience of Square Pegs wannabes. Shortly afterward, I also bought the CD of their third album, “Good For Your Soul,” and until last weekend. That was the extent of my Oingo Boingo collection. Such that it lasted until the present, anyway. At one point, I had copies of the mid-late period albums “Boi-Ngo” and “Dark At The End Of The Tunnel,” but they failed to impress as on the former, too many harsh edges had been filed off for my tastes, and the latter was out and out as dismal an album as I’d ever heard. 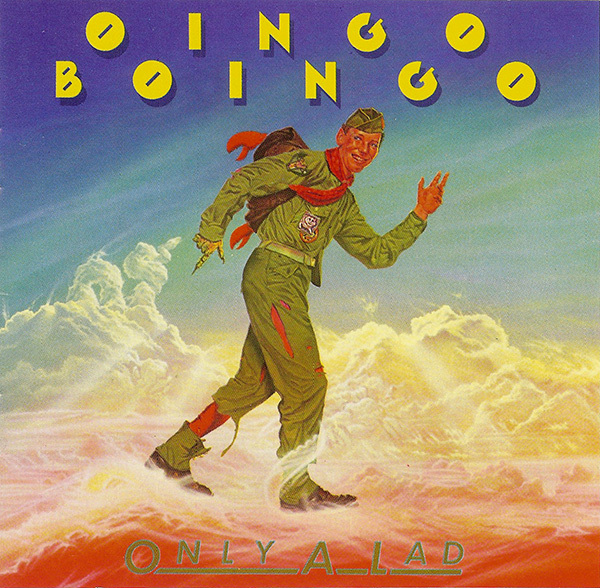 Almost Oingo Boingo goes grunge, as unappealing as that picture is. The video I saw from the final, titular “Boingo” album was even worse! Gray, depressing music from a gray, depressing album! It seemed like the band moving from A+M to distributor MCA saw them being filed down to better fit in the mother corporation’s round holes. But through all of this, the fact remained that until last weekend, I had never heard the first Oingo Boingo album. I was certainly familiar with “Little Girls” since the band made a video for it in those decidedly different times when making an ironically jocular song about pedophilia was considered to be a perfectly acceptable thing. 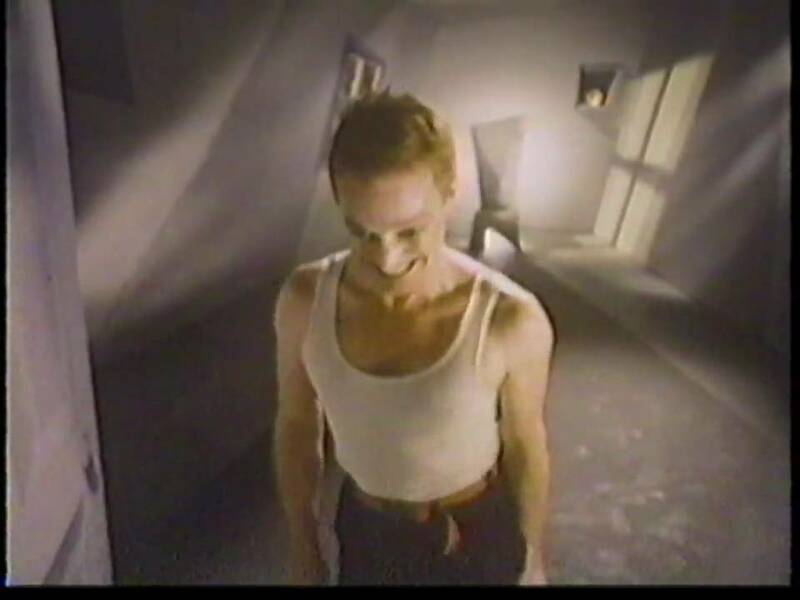 The video, as directed by Mystic Knights founder and Danny Elfman’s brother Richard, was pretty riveting stuff, primarily for the shots of Elfman lip synching the tune with as evil a grimace as was possible. On the album, shorn of the disturbing visuals, one is left with a variation on The Stranglers “Bring On The Nubiles” minus that song’s offensively blunt lyrics. One track from this album that I simply can’t believe that I never managed to hear was their brilliant New Wave deconstruction of The Kinks’ venerable “You Really Got Me!” The lyric sheets jokes “you should know these lyrics by now,” to make a witty comment on the issue of publishing royalties, but the track is no joke. It is a tour de force of complete reinvention with the song ripped apart and stitched back together with the most berserk time signature possible. The tone shifted throughout the song constantly with backing vocals leaping octaves like gazelles. They even used a talkbox on the backing vocals! The end result is twice as long as the original and frankly, it could have gone on for much longer. It is one of the best New Wave Covers I’ve ever heard. “On the Outside” is a great tune about the narrator’s inability to fit into any situation. Just the thing for alienated New Wavers to nod their heads knowingly to. As with most of this album, the busy arrangement is a constantly evolving Chinese Puzzle Box of a tune with the song served by an almost overstimulating array of filigree. Let it also be said, that the vocals of Elfman more than match the level of stimulation and commitment by the talented eight piece band. He simply had to compete with the level of energy that the rest of the band were putting out or else the whole thing would have deflated before it got off of the starting block. His vocal performance here matches and compliments the music with him leaping octaves with the band sometimes all within the same vocal line. It’s a full-on 100% performance that never leaves the listener in danger of nodding off. Where the album derails for me is in the point of view presents in almost half of the numbers. Songs like “Perfect System,” Only A Lad,” and especially “Capitalism” seem the stuff of Orange County Republicanism set to the least likely musical accompaniment possible. Having a great alienation anthem like “On The Outside” sitting literally next to the sour, anti-commie anthem “Perfect System” creates frissons of cognitive dissonance in me. To say nothing of the hostile rant that was “Capitalism!” As if viciously attacking ineffectual left wing radicals isn’t anything but bullying people who have no power what so ever! Another misstep was the conceit of including a hostile attack on critics on “Imposter.” Is there anything more immature and self indulgent than wasting 10% of your debut album getting even with people who had the temerity to disagree with your artistic statement? Again, this song reflects a warped perspective that fails twice fold because not only does it make the band [actually Elfman, who writes the songs] seem petty and childish, but it only empowers any negative criticism directed towards the band. Such as the words I’m typing right now. The album ends with what must have been a throwback to the “Mystic Knights of the Oingo Boingo” days with “Nasty Habits,” an almost intriguing song about what lies beneath the surface of our civilized veneer that’s scuttled by the Broadway/circus music bed that strongly radiates of the group’s theatrical origins. It’s a throwback that hampers the band’s movement from conceptual artists to New Wave rock band. The albums ended up being a decidedly mixed blessing for me. Heck, it’s not only me that can’t wrap my head around much of this stuff. Even Elfman rolls his eyes over the snotty, right-wing cant that comprises far too many of these songs. The irony is, that the immature, Ayn Rand-reading teenager I was* would have loved these tunes in 1980! At least Elfman and I managed to mature and get beyond the limitations inherent in many of these tunes. * I have changed a lot in the 50 years I’ve been walking this planet. At least my eyes are open. This entry was posted in Record Review and tagged Danny Elfman, New Wave Cover Version, Oingo Boingo, Only A Lad. Bookmark the permalink. Yes, the right-wing sentiment of “Only A Lad” in particular and “Capitalism” et al really put me off this album, though as you note, half of it is pretty good. Grateful that they moved up and on from there before the inevitable slide into mediocrity. And yes, “I Love Little Girls” was the more palatable version of “Nubiles” but I’m just still fascinated at a universe where either of these songs was approved to record instead of reserved for only the most macho all-male frat party performances. Still, I confess that I know the words to “Little Girls” by heart and it was something of an anthem of mine … in that I seem to mostly prefer women of petite stature, I hasten to clarify!! My late brother had this album. It stood out in his collection for it’s uniqueness.as there was nothing at all like this present either before or after it. His tastes blew very much with the winds of whatever was commercially popular at the time, if there was a K-Tel ad for a Statler Brothers album he was into that, Elvis (P not C), Tony Orlando & Dawn, Kiss. The only true mainstay of our youth for him was the Rolling Stones. This was one that should have wound up in my collection and not his,,,,to this day I can’t say why he liked this one and held onto it as long as he did. Tim – The question arises… How did your brother encounter this album, since it was far below the cultural radar of its time? Was it the video for “Little Girls?” If memory serves, I might have first seen it on HBO’s Video Jukebox. Nick Melton – Welcome to the comments! So you’re saying that Danny Elfman was just immature? That’s reassuring. Sort of.